Gordon Scott, Moira Orfei, Harold Bradley and Piero Lulli are in the back. Not all PEPLUM movies have wrestling scenes but many of them do. Fun to watch or a waste of time? Wrestling scenes are mostly a waste of time in my view. I would greatly prefer an attractive female dance routine, with the dancers showing as much bare skin as permitted by the Code. Female slave market scenes are also always great. I wish you would do a compilation of such scenes. Yes, I confess that I am an evil old sexist. Waste of time? Are you kidding me? The whole “peplum” era is an epitome of the ancient times where men wrestle not just for sport but as entertainment to the rich. It’s a nice showcase of manhood and raw brutal strength. I'm a big fan of well-performed fight scenes, as much as I am of really good dance numbers. Both are displays of the skill of the actor. In the case of fight scenes it's all about convincing the audience that the brawl is the real thing, be it a John Wayne bare-knucle slug-out, or a swashbuckling Errol Flynn rapier duel. 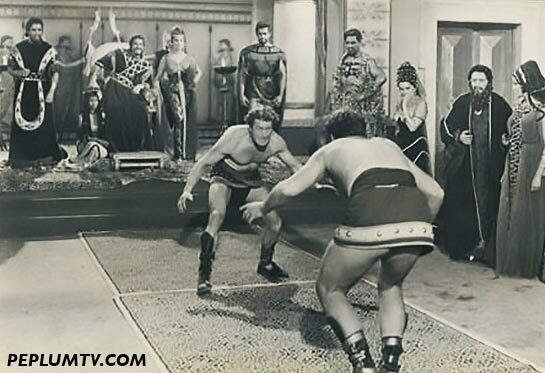 Peplums are the only movies where the art of wrestling is displayed, quite a different fighting technique than what's usually employed in other historical films. So I'm more than happy to keep them in there! I like those scenes and I've uploaded many of them at my PEPLUM TV channel. But I'm also aware that some really don't like them. For me, they're part of the PEPLUM universe so it's always fun to see them. Article of the week : Twin productions!